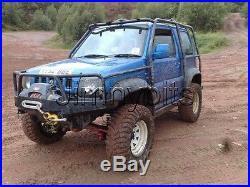 Suzuki Jimny 3 / 75mm Pro Comp Suspension Lift Kit, Right Hand Drive Model RHD. This kit allows you to lift your Jimny up 3" giving it a better stance and better "off road" ability with longer shocks for extra articulation, this kit does lift your jimny 3" and you can still drive it, but its a part kit and more parts are needed to do the lift fully. This kit is ideal for people who want to do there lift in stages or have sourced other parts needed for the lift already. The springs have the complete range of heat treatment processes, hardening, quenching and tempering, are all digitally controlled to ensure the correct hardness is achieved. Full shot peening, pre-setting and load testing ensure a long and fatigue free life. The springs are nice and flexy and not stiff, and are slightly uprated to cope with the extra height and extra weight drivers can carry on offroading trips. 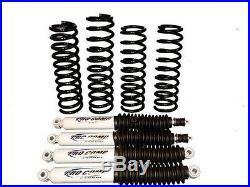 The kits come with specific LHD and RHD springs and also LHD Diesel springs. The kit comes with Pro Comps excellent ES1000s which are perfect for the jimny and the most popular as they are not as stiff as the Rough Country shocks and the ES3000s or ES9000s. 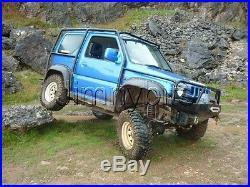 The kit above is the minimum you need to lift your jimny and drive away but here are some of the main. Do i need to fit extended brake hoses? Yes you would need to fit extended hoses. Can i fit castor correction bushes instead of corrected radius arms? Yes you can BUT, it does not solve the problem of vague steering and the bushes can't correct the angle fully, so you would still have some castor issues but some people do accept this. 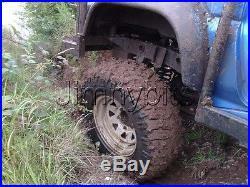 Do i need the rear shock relocators? No you dont need them but they bring the added benefits of removing extra strain from the lower bushes and also give a little more rear travel. Do i need adjustable panhard rods? Yes you do in an ideal world, as you find the axles move to one side. Not going to be in? You can re-arrange the parcel to be delivered to over 2500 locations like Halfords, Bargain Booze, Local chemists to supermarkets! With most open until late! For more information about this free service visit here. OR Northern Ireland, Southern Ireland, Scottish Isles, Channel Isles, All other isles off the mainland. The cost is not normally a great deal more but just drop us a message and we'll give you a quote. Return posting costs will be at your expense. Please check this listing page carefully as the answer is usually there. The item "Suzuki Jimny 3 / 75mm Pro Comp Suspension Lift Kit, Right Hand Drive Model RHD" is in sale since Friday, December 06, 2013. 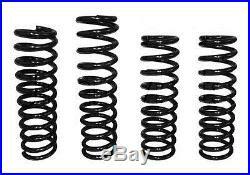 This item is in the category "Vehicle Parts & Accessories\Car Parts\Suspension & Steering\Coil Springs". 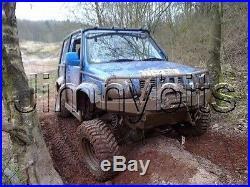 The seller is "jimnybits" and is located in Stoke-on-Trent. This item can be shipped worldwide.